Just how good an idea is fried chicken-infused vodka? Welcome to Thanks, Commenters!, in which we mine, borrow, and steal ideas put forth by The Takeout’s commentariat. I’ve never had the pleasure of tasting a cocktail that’s been fat-washed—a drink infused with, say, butter or bacon fat—which was why I was so interested in learning about the practice during Butter Week. My takeaway is it’s less about the slick texture imparted in the cocktail, more so about flavor. I totally made this, and I’m writing about it. After 24 hours, the vodka took on the color of a rich chicken broth. Smell-wise, it wasn’t as appealing. It reeked in a way a liquid soaked with a fatty meat would smell. The taste, however, wasn’t nearly as bad. The burn of vodka dominated, but several second later, the taste of salt, meat, and fry batter appeared on the palate. It wasn’t bad, but it wasn’t delicious either. The two flavors don’t quite mesh. 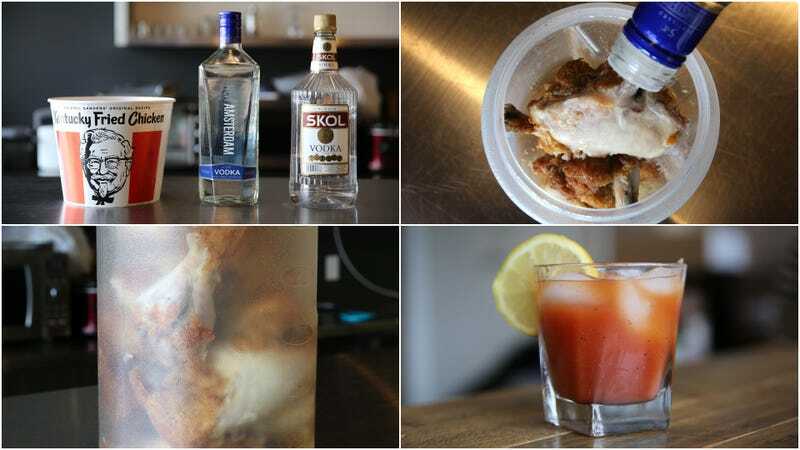 The most obvious application of fried chicken-infused vodka is a Bloody Mary. I mixed myself a iced glass with 2-to-1 Bloody Mary mix-to-fried chicken vodka, and a squeeze of lemon. It tasted like... a Bloody Mary. The sharp tomato and vodka flavors overwhelmed whatever fried chicken savor that was present. I do think there’s a slight bit more umami with this infused vodka, but every person who sampled this in my office couldn’t discern any difference from a standard Bloody Mary. I’m not sure it’s worth the trouble—nor the smell—to make this vodka again, but at least I got to denude a bucket’s worth of KFC fried chicken of its floppy-crispy skin. That was delicious.